There are a number of different ways in which vision can be distorted and without a medical assessment it is difficult to isolate the exact mechanism and defect. The sense of vision is complex with 20/20 vision on one end and blindness at the other. However, there are many conditions that can cause a variety of forms of visual distortion in-between. Distorted vision is a general term to refer to disturbances in visual acuity. It can range from blurring to double vision, blind spots, tunnel vision or hazy and cloudy vision. Blindness is not just a distortion as most people would refer to it. Instead blindness would be considered as loss of vision and is therefore not discussed in detail in this article. However, some forms of partial blindness may be covered. How does normal vision work? It is important to understand how the sense of vision works in order to understand how distortions may arise and present. Vision is the means by which we perceive light from our environment. The human eye has the ability to perceive light within a certain wavelength range, or what we call the visual spectrum. Our abilities are also limited by distance and the brightness of the light source in the environment. Light reflects off objects and then enters the eye. It passes through the cornea where the light rays are bent. From there it enters the eyeball through the pupil, an aperture that is created by changes in the size of the iris. The size of the pupil allow more or less light into the inner eye. From there the light rays are bent further by the lens to ensure a sharp image is focused on the light-sensitive inner layer known as the retina. A certain area known as the macula is responsible for vision and the sharpest images are formed when light strikes a small portion known as the fovea. In order to reach here the light also has to travel through two chambers in the eye, the anterior (front) chamber and the posterior (back) chamber, which are filled with the aqueous and vitreous humor respectively. The light stimulates nerve endings in the retina and this generates electrical impulses. These impulses are then relayed by nerves from the eyeball to the visual cortex in the brain. The signals are then deciphered by the brain so that the light is perceived as images in our environment. Any disturbances in any of these structures can therefore lead to distorted vision. There are many different causes of distorted vision. The more common conditions related to defects of the eye and optic nerve have been discussed below. However, various other conditions can also impair vision, like a stroke, where a portion of the brain tissue dies. Similarly there are systemic diseases like hypothyroidism which may also affect the eye and vision, along with various other organs. Blurred vision may occur for various reasons but one of the more common causes is refractive errors of the eye. This is where the cornea and/or lens do not properly bend the light entering the eye for a sharp image to be focused on the most sensitive part of the retina. 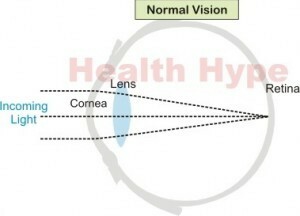 Myopia (nearsightedness) is the most common type of refractive error. The light falls in front of the retina and distant objects are difficult to see while nearby objects are clearly visible. 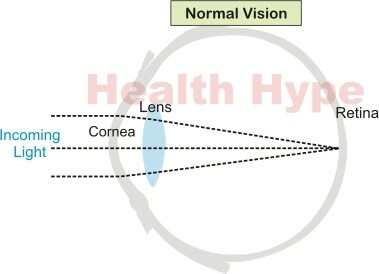 Hyperopia (farsightedness) is where the light falls behind the retina. Nearby objects appear blurred while distant objects are clearly visible. Astigmatism is where the curvature of the cornea or lens is not smooth and light is bent in varying ways. As a result vision is blurred whether objects are near or far. Presbyopia is an age-related loss of visual acuity where the eye’s ability to focus on near objects is gradually lost. It can start in early to mid-forties. Eyestrain cause temporary blurring of vision due to overuse of the eye. It most commonly arises with using computer or TV screens and reading for long hours especially in poor light. Cloudy vision is usually a result of some obstruction of light entering the eye. Normally the internal structures are translucent and allow for light to pass through. However, when some opacity arises in any of these structures then the passage of light is affected to varying degrees. Cataracts are the most common cause of cloudy vision. This is a condition where the lens of the eye becomes opaque gradually. Trauma to the eye can affect the vision in various ways, from blurring to cloudy vision and double vision. Depending on the severity of the injury there may even be vision loss. Keratitis is where the cornea is injured or infected. This affects the entry of light into the eye as well as the bending of the light. Diabetic retinopathy is where the blood supply to the retina is impaired as a result of long term and poorly managed diabetes. It presents with a range of visual defects, including blurred vision and partial loss of vision. Macular degeneration is where there is tissue deterioration of the macular, the light-sensitive portion of the retina. It is commonly related to advancing age and lead to blindness in time. Partial loss of vision can refer to distorted vision in various forms but in this instance it is refers to some degree of vision loss but not complete blindness. This includes blind spots and loss of peripheral vision (tunnel vision). Retinal detachment is where the a layer of the retina detaches from the underlining layers that provide nutrients and oxygen via the bloodstream. Once this layer dies, vision is lost to some degree. Glaucoma arises with increased pressure within the eyeball and this leads to damage of the optic nerve which carries signals to the brain to enable the sense of vision. Macular degeneration as discussed above. Optic neuritis is where the optic nerve becomes inflamed for various reasons. The prevents the normal transmission of signals from the eye to the brain. Retinitis pigmentosa is an eye condition where there is deterioration of the retina. It refers to a group of disorders that are inherited. Eye stroke is a condition where the retinal artery that carries oxygen and nutrients to the eye becomes blocked.